Note: There is a newer tutorial for this topic at Following a Spline, however, some info from this tutorial such as link/export hasn't yet been added to the new tutorial. There is also another very out-of-date tutorial for synfig 0.61.08. The above example links show an animation in which a layer follows a moving curve, and rotates to follow the curve as it moves. How was that achieved? It's currently quite complicated to set up an arrangement like this in Synfig Studio, so I'll describe here how it works. If you download the .sifz file and load it into Synfig Studio, it really isn't easy to see how the effect is achieved. 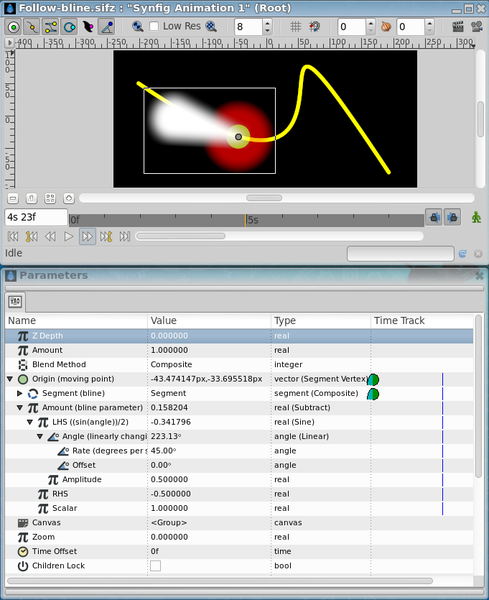 When this animation was created (in 2007), it was possible to make a layer track a curve with just 2 points, but not to get it to track a general curve. Since then, new conversion types called "Spline Vector" and "Spline Tangent" have been added to Synfig, and so tracking a general "Spline" is now possible. See this tutorial for an example. The animation lasts for 32 seconds and has 3 top-level layers. This is a very simple animation other than the two parts with links (below), which control the location of the moving blob and the shape of the white beam of light respectively. These two parts are described separately. direction of movement - The fuzzy white beam of light. This is a simple spline with a feather of 0.3 units to make it fuzzy. Its vertices are connected to the ValueNode called "beam of light". inner circle - The smaller yellow circle. Not animated at all. outer circle - The larger red circle. Not animated at all. Note the technique here. I could have animated both of the two circles and the beam all separately, but it is much simpler to group them into a single Group layer and animate the position of that instead. The moving curve which the object follows. It has waypoints at 0s, 16s, and 32s to make the line move. I exported four of its animated ValueNodes so that I could use them later to define the curved segment that the blob should follow. The moving curve is an Outline Layer, created using the Spline Tool. It only has 2 vertices. 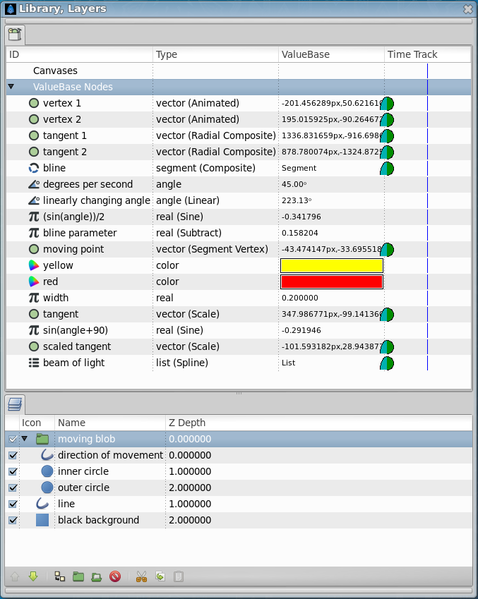 Note that the Spline Tool creates layers which have lists of SplinePoints to define the shape of the layer, and that SplinePoints contain more than just vertices and tangents. SplinePoints also have parameters like split tangents', and "width", which aren't relevant when creating a Segment, so I only exported the four ValueNodes that I needed to create the Segment. A solid black background. Not animated at all. segment - this uses the ValueNode called "spline"
amount - this uses the ValueNode called "spline parameter"
Vertex002 - This is the other end of the fuzzy white beam. It was a width of 5 units to make the beam diverge. Its position is connected to the ValueNode called "scaled tangent". The "scaled tangent" ValueNode is the offset vector from the center of the circles to the wide end of the beam of light. Segment - this re-uses the ValueNode called "spline"
Amount - this re-uses the ValueNode called "spline parameter"
LHS - The left hand side of the subtraction - this is connected to "linearly changing angle"
RHS - The right hand side of the subtraction. It's a constant -90. Amplitude - This is a constant 0.4, which simply scales the length of the beam of light down to keep it mostly on the screen. The "spline" ValueNode is a segment representing the curve to follow. It connects to the vertex1, vertex2, tangent1, and tangent2 ValueNodes, as exported from the 'line' layer above. The "Spline parameter" ValueNode is number ranging from 0 to 1, which indicates how far along the segment to go. 0 means "use vertex1" and 1 means "use vertex2". I want the point to travel along the curve sinusoidally, meaning it will travel fastest in the middle and slow to a momentary stop at either end. This makes the movement look smoother than using a linear movement. The sin() function returns a number between -1 and 1, and I want a value between 0 and 1, so I halve the sin() value, giving -0.5 to 0.5, then add 0.5 to it, giving 0 to 1. Angle - This is connected to "linearly changing angle"
Amplitude - This is used to scale the value. Since I want sin(Angle)/2, the value is a constant 0.5. Rate - How many degrees per second to increase. In the animation this is set to a constant value of 45 degrees per second. This means that one complete cycle (from the center to the right end, to the left end, and back to the center) will take 360/45 = 8 seconds to complete. This gives us four complete cycles in the 32 second animation. Offset - The value at the beginning of the animation (time = 0). Changing this to 90 for example will make the blob start at the right-hand end of the line. while changing it to 180 will make the blob start in the middle, but facing (and traveling) left. This screen shot shows all the exported ValueNodes in the top right. Note that a few of them aren't necessary, such as the "yellow", "red", and "width" ValueNodes. Well, actually none of them are necessary - it's possible to do the whole animation without exporting anything at all. It would lead to a small amount of duplication, since both the position of the blob and the direction of the light beam are driven by the same angle. But mainly exporting is a way of naming the ValueNodes, which acts as a kind of documentation. In the Parameters panel in the bottom left you can see some of the sub-parameters of the 'moving point' ValueNode. Canvas window and Parameters panel. This page was last modified on 2 January 2015, at 09:45.